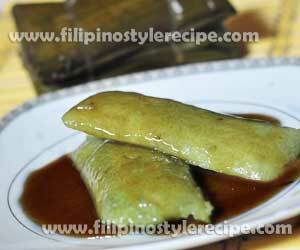 Filipino Style Recipe: Suman sa ibos is a popular Filipino delicacy made from glutinous rice, coconut milk and salt then wrap in buri leaves. Cook in a boiling water until done then serve with latik sauce. 1. In a large bowl, place glutinous rice, coconut milk and salt then leave it for at least 20 minutes or until the rice absorb the coconut milk. Set aside. 1. Fold the end of buri leaf by half inch then fold the bottom edge into a triangle. 2. Swirl the buri leaf in an overlapping manner to make a tube then lock to prevent from swirling back. 3. Scoop the mixture into mold then seal then end with toothpick and tie with buri strips. Set aside. 1. In a big pot, arrange the pieces then pour enough water to cover the wrapped rice mixture. 2. Bring to boil in a low heat for at least 1 1/2 hours or until done. 3. Remove from the pot then let it cool. 4. Unwrap then transfer to serving plate. Serve with latik. 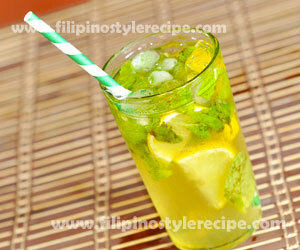 Filipino Style Recipe: Binallay is another popular Filipino delicacy from northern part of Luzon specially in Isabela Province. 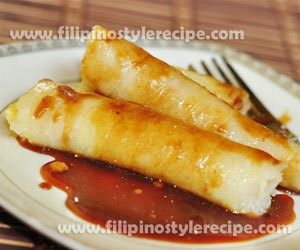 Like other suman we will use glutinous rice, but we grind the rice into flour and mix with water. Wrap the rice mixture in banana leaves and cook in a boiling water until done then serve with latik sauce. 1. In a bowl, place glutinous rice and water then soak for at least 3 hours. Drain. 2. Grind soaked rice into flour then mix with water until well blended. 1. Singe the banana leaves into flames for a few seconds but do not burn. Let it cool then wipe with clean cloth. 2. Grease banana leaves with coconut oil then scoop 3 tablespoons of rice mixture, fold the leaf to wrap the rice mixture. 3. Grab 2 pieces of wrapped rice mixture then tie with folded sides together using a string. 1. In a steamer, pour enough water then steam the wrapped rice mixture for 1 1/2 hours or until done. 2. Unwrap the binallay and transfer to serving plate. Serve with latik. 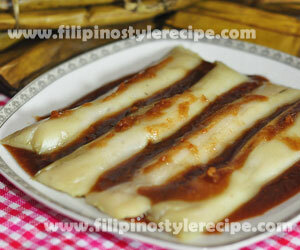 Filipino Style Recipe: Suman sa lihiya(lye) is another popular Filipino delicacy from southern part of Luzon specially in Batangas Region. Like other suman we will use glutinous rice, but we treated the rice with lihiya(lye water) until the color turns to yellowish. Wrap the rice mixture in banana leaves and cook in a boiling water until done then serve with latik sauce. 1. In a bowl, place glutinous rice and water then soak for at least 3 hours. 2. 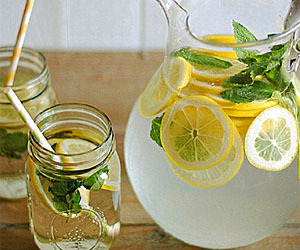 Drain water then pour lye water. Mix well until color turns to yellowish. 1. Arrange the bigger leaf(topside down) on a flat surface then place the smaller leaf(topside up) in the center of bigger leaf. 2. Scoop 3 tablespoons of rice mixture on smaller leaf, fold the leaf to wrap the rice mixture. 3. Grab 2 pieces of wrapped rice mixture then tie with folded sides together using cotton string. 3. Unwrap then transfer to serving plate. Serve with latik.